When time goes by, the previous back files stored on Android device become useless but takes up large amount of storage space on Android phone, making Android device run slowly and prompt insufficient memory on Android device. However, the Android backup files are generally hided by default. So how to delete backup on Android device to free up Android space? This user guide will help you figure it out. In some ways, automatic backup is one of the great features on Android phone, which is developed by Google and used to automatically backup your photos on Android phone to Google Drive. Sometimes, there would contains some pictures you don't want to upload to Google server but it did, so you want to delete the auto backup, and it is also a good way to free up Android storage, too. Step 1. You need to stop auto sync of your photos on Android device at first. To do so, please go to "Settings" > "Accounts" > select "Google" and tap your Email ID. Step 2. Then uncheck "Sync Google + Photos", "Sync Picasa Web Album" and other options that you don't want to sync automatically. Step 3. Then you might clear caches of Gallery to delete photos from Gallery. To do so, please go to "Settings" > "Application/Apps" > "Gallery" > "Clear data". Step 4. Then turn off and on your phone, you will not see the pictures on your Gallery now. To completely delete backup files on Android device, it is kindly recommended a professional third-party cleaning tool - Android Backup Cleaner (Windows/Mac). With it, you can easily clean Android backup files with one simple click. And it will permanently erase all files from Android without any chance to be recovered, including photos, videos, contacts, messages, call history, search history, notes, apps, documents and all other personal files. And it is fully compatible with all Android device, including Samsung, Huawei, LG, HTC, Sony, Motorola, ZTE, OPPO and etc. Here are the free trails of the program in Windows and Mac version, please download the right version on your computer to delete Android backup files with ease. Note: Before deleting your Android backup files, please make sure you have back up your Android data to computer in case of unexpected data lost. Step 1. Launch the Android Backup Cleaner on your computer after installation, and make your Android phone connected to computer via a USB cable. Then install the MobileGo Connector app on your phone to be detected by the program successfully. Step 2. After that, please choose the right erasing mode and erasing level according to your need. This program will detect your files on Android phone and show the interface as below. 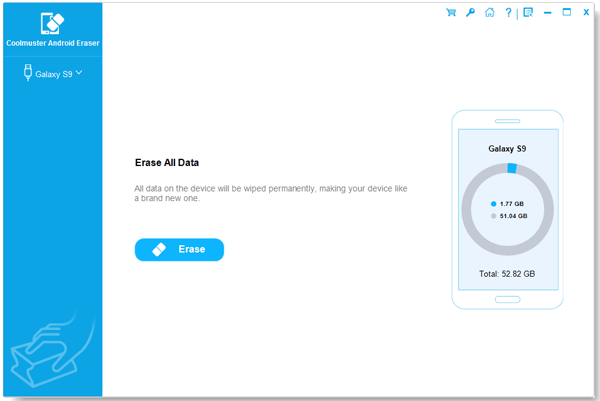 Simply click "Erase All Data" option and hit "Erase Now" button when it prompts. Then type "delete" on the pop up window to confirm your action and start to delete all your Android data, including the backup files on Android. See? So simple. Please download the Android Backup Cleaner on your computer to better manage your Android space now.